It’s on this point that Patrikarakos reveals his disdain for certain theoretical approaches, marking one of the book’s weakest arguments. He claims that ‘the rise of postmodernism within our academic institutions and its lack of belief in knowable “objective truth”’ has enabled ‘the lies of both the Kremlin and Trump to flourish’ (14). Though seemingly casual and off-hand, this statement implicates rigorous theoretical approaches in the rise of totalitarian governments. Approaching academic research with the humility of never being fully able to grasp the truth from one’s limited human perspective should not be conflated with a flat-out embrace of ‘alternative facts’. Patrikarakos’s comment could be an interesting argument to develop, but it comes off a little condescending and, in my mind, even potentially incendiary. It’s also ironic considering that a book like War in 140 Characters—which places words and language at the centre of the social construction of war—might not have been possible without a theoretical predecessor like postmodernism. 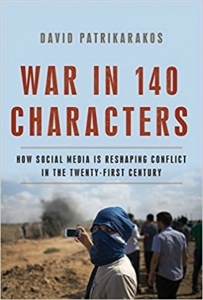 War in 140 Characters is, after all, a book fundamentally about the power of narratives to shape our world and the changing nature of storytelling and war-making. And what makes it so readable is that it is also a book of stories, drawing readers into the personal, poignant lives of individuals to explore some of the most important questions about the transforming face of contemporary warfare.